The Dakota, the Apthorp, and the Astor regularly top the list of the most incredible apartment houses on the Upper West Side. 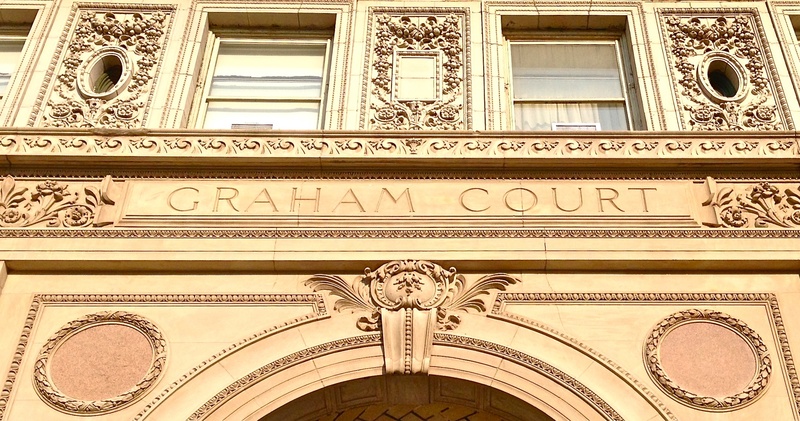 A bit farther north on West 116th Street is a lesser-known building that belongs in that group: Graham Court. It’s a box-like eight-story structure containing 100 apartments that spans the block to 117th Street at Adam Clayton Powell Boulevard. 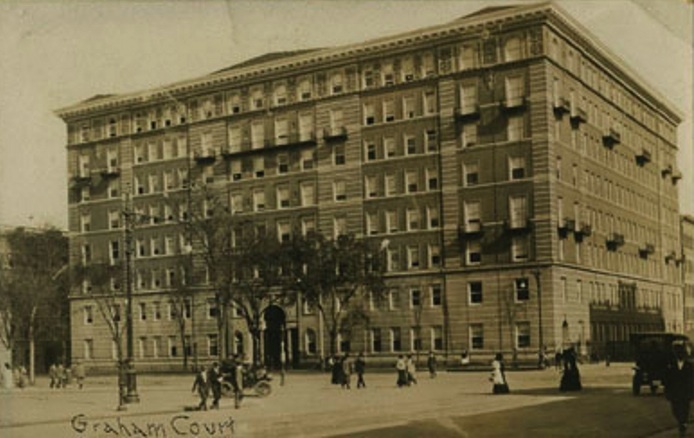 Designed by the men behind the Apthorp and Astor, Graham Court opened in 1901 and was considered Harlem’s first luxury apartment house, thanks to its limestone facade, Gustavino tiles, and servants’ quarters on the top floor. “Graham Court’s residents, all of whom were rich and white, entered the building through a gracious arch that led into a grand inner courtyard built over an underground stable,” wrote Jonathan Gill in Harlem: The Four Hundred Year History From Dutch Village to Capital of Black America. 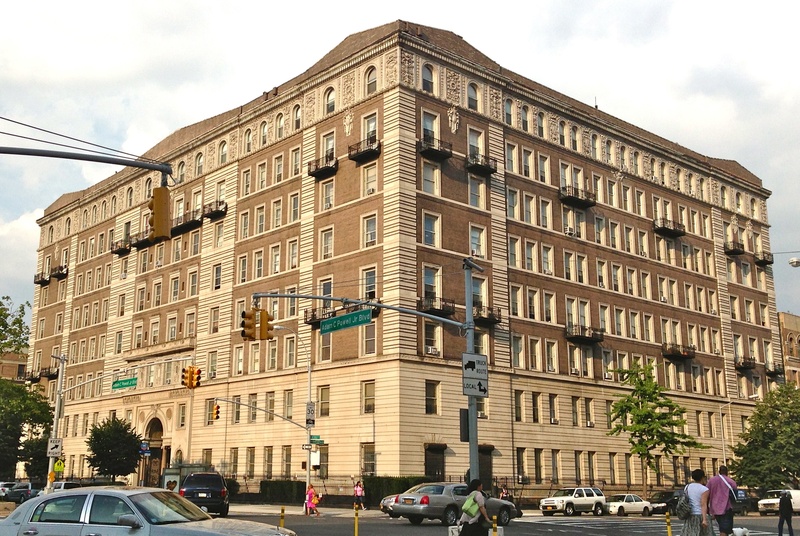 Like a lot of developers who rushed to cash in on the growth of Harlem at the turn of the century, the people behind Graham Court probably thought it would remain rich and white forever. But a 1904 real-estate crash left blocks of empty buildings. African-American New Yorkers began relocating uptown, filling those buildings. In 1928, the first black resident moved into Graham Court, according to a New York Times article. Graham Court hit hard times in the 1960s and 1970s. But the facade was landmarked in 1984, and though I don’t know what the apartments inside look like, from the street this remnant of Gilded Age New York appears to be well cared for. This entry was posted on July 18, 2013 at 6:50 am and is filed under Cool building names, Upper Manhattan, Upper West Side/Morningside Hts. You can follow any responses to this entry through the RSS 2.0 feed. You can leave a response, or trackback from your own site. The film New Jack City (1990) used Graham Court as a setting; it’s the apartment complex that Nino Brown and his associates take over as their stronghold. I think it’s in a Spike Lee film too. Maybe Jungle Fever. 116th above the park is, indeed Harlem. West of Morningside Park at 116th is not Harlem, however. I lives in this building and can attest — the apartments are beautiful. 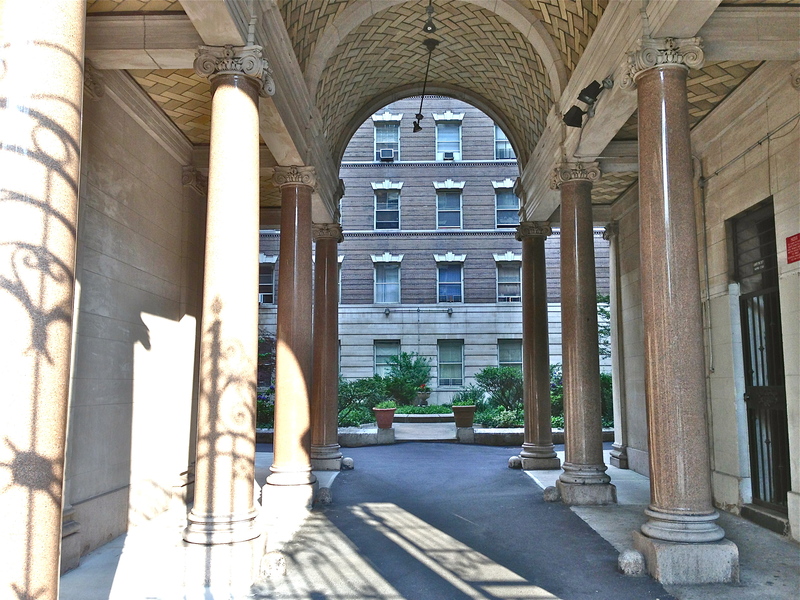 They are the same layout as the Apthorp, but slightly smaller (though huge by most standards). One thing you neglected to mention — the building has stables beneath it. The intention was that, in order to convince middle class people to leave brownstones for an apartment building, they had to have all the luxuries of a brownstone, including their own carriages. Ah, thanks for the clarification about the neighborhood borders. Jonathan Gill mentions the underground stables in his book. I guess underground stables sounded like a building amenity–the 1901 equivalent of a refrigerated food room off the lobby and an indoor communal playroom/party room for kids! the graham court apartment of sheila bridges, an interior designer, is featured in the new york times today (7/18). The apartment is pretty typical of most in the building. Mahogany wood throughout (including the windows until about a decade ago when the management replaced them all), as well as ivory inlays around the room. The smallest apartments have three mosaic fireplaces. Pocket doors between the living and dining rooms and hallways doors — a key feature at the time to separate private from public — as well as mosaic entryways and beautiful hardwood floors are all elements of this stunning building. Half of the building remains rent stabilized, while the other half has bumped up to market rate. At first I really loved your blog… but then reading some of your postings on “Upper Manhattan” er, Harlem … it becomes clear that there is a lot of misinformation regarding boundaries/communities. My family has populated Harlem since the early 20th century and although politics and the new wave of residents would love to separate themselves from my community the fact remains… Harlem extended from 96th on the east side to 110th on the west side from river to river all the way through 155th street. When it became clear that Columbia and the residents above Morningside Heights wanted to separate themselves they redlined the area and established themselves as part of Community Board 9. As a “factual” blog I am disappointed that although you provided great info regarding lower manhattan your info for my beloved community seems to be misleading and discrediting to those who live and preserve the Harlem communities culture. But then again… no surprise there with the gentrification of Harlem and other similar communities. 116th is Harlem. It actually starts on 110th and ends on 159th. Harlem is from 110 street to 155 on the west side….